A black tie wedding mixed together with a little Island style. 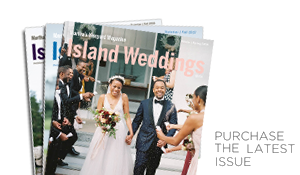 Before they decided on any details, Melissa Murphy and David Lue knew the vibe they were striving for: black tie, but Island-style. Melissa and Danielle knew from prior experience that popular Island venues can book up quickly, so they wasted no time making their selections. Melissa was enamored with the Old Whaling Church, an easy choice for the ceremony. And Farm Neck Golf Club provided the casual/formal ambiance they were looking for – plus, the whole family has a penchant for golf. The couple was engaged in March of 2016 and had confirmed nearly every vendor for a September 2017 wedding within the month. The ceremony and reception ended up exactly as elegant as Melissa had hoped they would be. (It was designated a mason jar–free zone, she said with a laugh.) But once guests were wined and dined, the couple wanted to throw a fun, let-loose party. With Joanne Cassidy’s band The Vine Shakers on stage, that’s exactly what they did. At one point during the evening Joanne said to the crowd, “Hey, do you guys know every word to every song? !” When Melissa reflects on how perfect that perfect day in September turned out to be, that's the moment she returns to again and again.